The most interesting aspect of the new games is likely the new transformations that Necrozma has with the two mascot legendaries from Sun and Moon, performing a Kyurem-esque fusion but without the idea of once having been the same Pokemon and more of what seems to be like, forceful integration. And then of course he goes ULTIMATE NECROZMA, and that’s just light lord all over the dang place. Dawn Wings Necrozma-GX is one of these forms, and you don’t have to worry about playing Lunala and Necrozma to get it out in some complex manner. He’s…she’s…it? I guess it’s a 180 HP Basic Ultra Beast, Psychic-Type, with a Dark Weakness, a Fighting Resistance, and a Retreat Cost of 2. Its Invasion Ability is its version of Keldeo-EX’s Rush-In, allowing Dawn Wings Necrozma-GX to swap out with whoever’s in front at will if it’s on the Bench. Historically these Abilities are useful and are popular, though they may not be as widespread outside of the main Type that they’re played in, and they are at their most useful when Float Stone is…floating around. Escape Board would not quite be enough to work the same way, since it only takes off 1 Energy in the Cost. Dawn Wings Necrozma-GX is also an Ultra Beast, meaning its attacks are locked into a single Type of Energy…period. 3 Psychic Energy gets you both its regular attack and its GX Attack, and they are both a doozy! Dark Flash hits for 120, and it’s unaffected by Resistance – sorry Metal, you gonna take the full brunt, and that means Dawn Wings Necrozma-GX can 2HKO most anything that isn’t Weak to it (in which case it’ll likely OHKO those). Tack on a Choice Band, and you’re set. And if you’re really in trouble, Moon’s Eclipse GX provides a great alternative once per game. The struggle is that you have to have more Prizes than your opponent, but considering that it hits for 180 AND prevents your opponent’s Pokemon from hitting Dawn Wings Necrozma-GX with any effects or damage from attacks, that’s a small price to pay to guarantee a potential OHKO on the right Pokemon and swing the momentum in your favor. It makes a tough customer out of it for sure! Dawn Wings Necrozma-GX has a bit more utility than its brother…sister…uhhh, sibling? Cousin. Whatever, it’s got more utility than Dusk Mane due to its Ability, but don’t let that fool you into thinking the other is in a terrible spot. I personally think Dawn Wings has a lot more going for it on an individual merit, but Dusk Mane does have a lot of support in cards like Magnezone and Mt. Coronet. Psychic Energy is also a little hard to accelerate right now – not to say it can’t be done, but it’s likely the only thing slowing Dawn Wings down. Keep an eye on both of these – they’ll likely be a big part of whatever deck they end up in! Arora Notealus: Necrozma kinda fulfills what I imagine we’d all like to see happen with Reshiram, Zekrom, and Kyurem – a final ultimate form that shows what they all look like together! Granted, Ultra Necrozma is only usable through a specific transformation while Necrozma is in one of these forms – Dawn Wings or Dusk Mane – but maybe that’s just the Pokemon Company toying with the idea of a potential Ultra Kyurem. You never know! Note: My reviews for Monday and Tuesday are finally posted; sorry for the delay! …because of its Ability, “Invasion”. This is the now familiar effect, allowing you to promote the Pokémon with Invasion from your Bench to the Active position, once per turn before you attack. This is just a renamed version of the Ability that made Keldeo-EX and Zoroark (XY – BREAKthrough 91/162) part of a simple but powerful combo, alongside an effect that zeroes out the card’s Retreat Cost. This combo allows you the capacity to fake using Switch once per turn. The regular attack on Dawn Wings Necrozma-GX is “Dark Flash” for [PPP], with an effect that allows it to ignore Resistance. 120 for three Energy is good, but not great unless it is an amount that can be easily supplied; for now, that does not describe [PPP]. Psychic Resistance is one of the more common forms, so ignoring it is handy, but I’d rather the attack just did a little more damage, as that has some or all of the same benefits but is also useful under nearly all other circumstances. 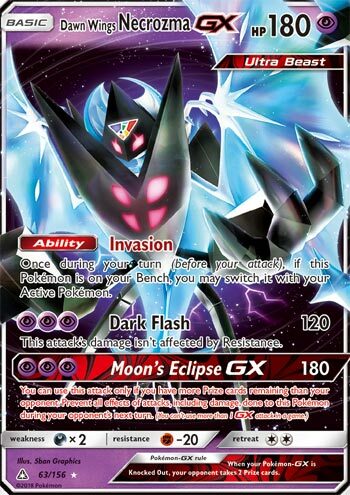 The GX-attack is “Moon’s Eclipse-GX”, also for [PPP]; this time the attack does 180 and prevents all effects of attacks – including damage – done to Necrozma-GX (or whatever is using the attack) during your opponent’s next turn. That’s pretty good; score a likely OHKO and your opponent has to attack something else or do nothing next turn. The catch is that the attack text also states you must have more Prizes remaining than your opponent or else you can’t use Moon’s Eclipse-GX. So it is a “comeback attack”, and trickier to use. It is still fairly good, with the main issue being that supplying [PPP] just isn’t a competitively viable strategy right now for most decks. Invasion alone should allow Dawn Wings Necrozma-GX to earn its way into many Standard Format decks. Some will just stick to Zoroark, which will probably include the many decks already running Zoroark-GX unless having four in play at once is a big enough deal. Others will just make do without such an effect, relying on switching cards and/or simple pivot Pokémon. In Expanded, Keldeo-EX is probably the safer bet; while there are more anti-Pokémon-EX effects than there are anti-Pokémon-EX/GX in the card pool, it is the latter that are proving the most competitive as the metagame shifts to include more and more of the new gimmick on the block. [G] Weakness and an attack that can be used (albeit not all that well) in any deck are also in Keldeo-EX’s favor, even if it has 10 less HP. There are a few decks, though, that can make full use of Necrozma-GX, or at least more use of it. Off the top of my head, all the competitive ways to power up Dawn Wings Necrozma-GX quickly have issues. There is Max Elixir, but that is a one time (per copy) trick and can whiff. Giratina [Prism Star] is unproven, but its Ability allows you to attach two Psychic Energy from your hand to itself when you Bench it; Ninja Boy can then swap Giratina [Prism Star] out with Dawn Wings Necrozma-GX, or you could just use Energy moving efects. Metagross-GX decks are a proven concept. Metagross-GX can use its “Geotech System” Ability to attach either [P] or [M] Energy from the discard pile to your Active. The thing is, for all three I think I’d rather use them to fuel something else; good thing Invasion means you’ll probably want Dusk Wings Necrozma-GX along for the ride, anyway. So things are good for Necrozma-GX in Standard, a little wanting in Expanded… what about Limited Format play? If you use Dawn Wings Necrozma-GX in a +39 build or Mulligan build, where it is the only Basic Pokémon in your deck so you’ve got to start with it, you won’t be able to make any use of Invasion or your GX-attack… and there’s a decent [D] presence in this set, so I strongly recommend against it. As a support Pokémon, you might risk it just for the Ability – there isn’t Float Stone in this set, but Escape Board wouldn’t be bad if you can pull a few and draw into one at the right time. If you’re running on mostly or only [P] Energy, definitely include this card! The future is also relevant to Necrozma-GX. More than once I’ve stressed how difficult it will be to get [PPP] onto this card, but you should know a Malamar has been revealed in Japan with an Ability that allows a once-per-turn attachment of a [P] Energy from your discard pile to one of your Benched Pokémon… and the Ability should stack. Dawn Wings Necrozma-GX earned third place by appearing on four out of five of our individual lists and accumulating 73 voting points. On my personal list, Necrozma-GX was #3 and I’m hoping Malamar will help it deserve it; it ranked so high on my list not because it was so impressive, but because everything struck me as less impressive… and I’m starting to think I sold those cards a bit short. Putting a benched Pokémon to the Active slot is nothing new. I thought Keldeo-EX’s Rush In ability was unique on it’s effect. However, as I rewind further, I found that Dragonite from Fossil was the first to perform this effect via Step In Pokémon Power. Oh, how the times have drastically changed. Nowadays, having this ability on a Basic Pokémon is far efficient than on a Stage 2. So now, I hope that players already know how good this ability is, and it pairs well with Float Stone, making two cards a constant Switch per turn, while shrugging off special conditions because the affected Pokémon was sent to the bench. Those attacks aren’t too shabby either. Both attacks costs PPP, which isn’t easy to meet at the moment outside of Max Elixir. However, Malamar SM6 is said to have an ability that will put a Psychic energy from the discard to one of your benched Pokémon. Hmm…looks like we have another option besides Bronzong and Eelectrik for energy recursion. The idea would be to use three abilities and bring Dawn Wings Necrozma to the active, ready to attack right away. Dark Flash does 120 damage while ignoring resistance, which makes it an almost 2HKO. Moon’s Eclipse does 180 and becomes immune to all effects and damage from any Pokémon for one turn. Having to be behind on prizes keeps this attack from being the best. Overall, pretty solid Pokémon that can double as a pivot Pokémon and a 2HKO machine. If you pulled one in Limited, you’ll definitely use it. Dawn Wings Necrozma (UP 161) rises into the meta from the Ultra Prism expansion set. This Pokemon has an ability that has garnered it the nickname “Psychic Keldeo” because it’s invasion does the exact same thing that the Keldeo EX from Legendary Treasures did – let’s you potentially power it up on the bench and then swoop in for a quick KO. At least it could if it had a massive attack like Dusk Mane Necrozma. Psychic Keldeo has two attacks: Dark Flash only does 120 damage but requires three Psychic Energies and Moon’s Eclipse GX which does a disappointing 180 damage (compared to Dusk Mane’s GX attack which does 250), although it does protect Dawn Wings from any damage or effects during its next turn. Good thing we don’t have any cards in the format that allow us to switch our opponent’s active and benched Pokemon! I will admit that I have not yet tried this Pokemon in a deck. I’ve watched a couple of videos on it, and it did do well in one but was abysmal in the other. I’m going to pass on Dawn Wings for Collinsville, though, those three Psychic energy attack costs are just too much for me. I really am leaning more and more towards single attachment attackers. This card even got 10 less HP than its Dusk Mane sibling. I’m just wondering how they decided to make these cards so imbalanced. They had to know that we would invariably put the two of them next to each other. Why did poor Psychic Keldeo get the short end of the stick?